An extensive art collection and the desire for light and space drove the design of the addition and renovation to a 1970’s timber frame house in NW Portland. The clients fell in love with the rustic character and the exposed wood frame of the house but the interior was very dark and offered no connection to the outdoors. 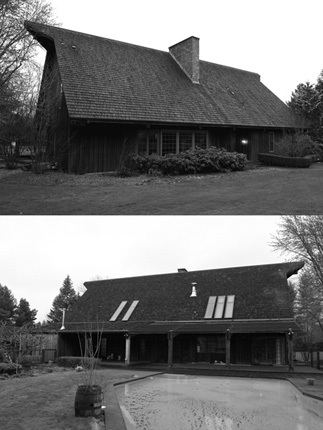 The new design solved this disparity by providing large opening in the exterior walls and roof in combination with a complete interior renovation. Throughout, the design juxtaposes the rustic character of the existing timber frame with a new modern interior and zinc clad additions. 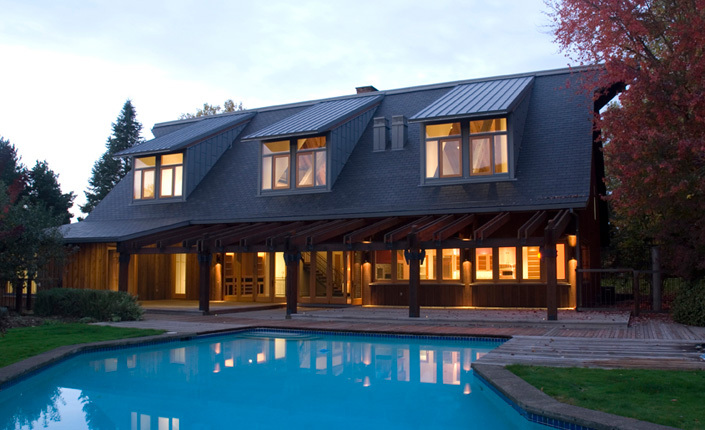 Outside, the north, street facing elevation is punctuated by two dramatic additions. 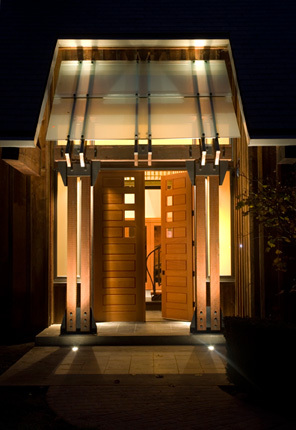 The first is new entry with a floating translucent glass canopy and 8’ high custom fir doors that hint at the expansive space inside the house. 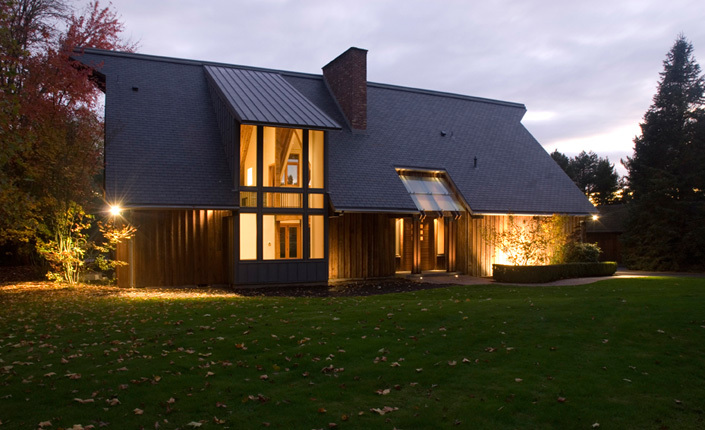 Second, adjacent to the entry, a zinc clad bay with 24’ high windows directs northern light deep into the house. To the south, the house completely opens up to a private back yard and existing pool. On the ground floor, the whole south wall of the house is removed and replaced with stained fir accordion doors and windows. 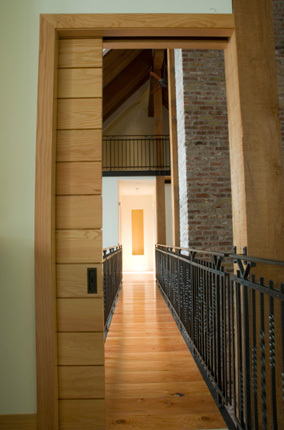 Two sets of 8’ high by 14’ wide accordion doors open up the family room. Similarly, the kitchen has three sets of 5’ high by 14’ wide openings that align with the new counters to form a seamless transition for al fresco dining. Above, three new 12' wide by 16' high zinc clad dormers stream light into the vaulted living room below. 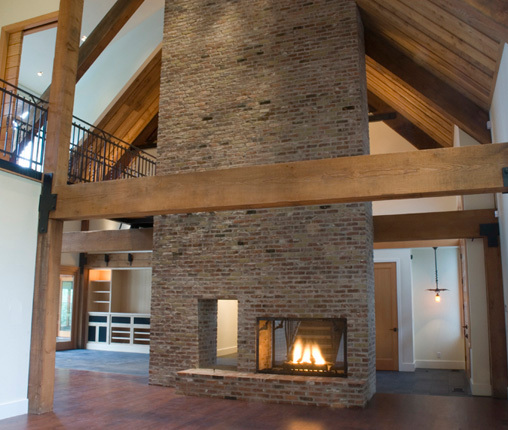 Inside, the focus is on exposing the existing timber frame beams and columns to organize the different spaces in the house. All non essential doors and walls are removed. 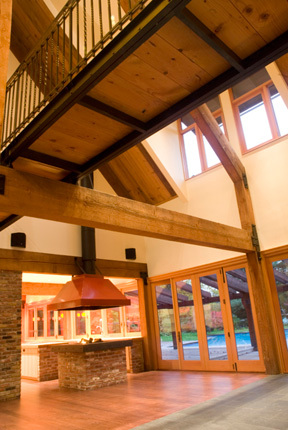 Separate bays of the timber frame structure are highlighted as elements in the space to give the house a cadence and scale. The first floor receives a modern new kitchen, library, living room and office. 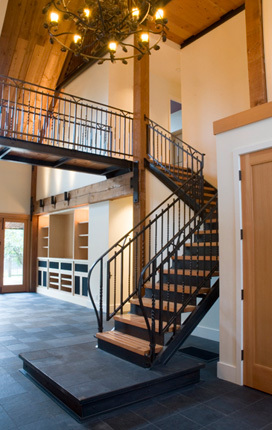 A new steel stair with salvaged fir treads and artisan forged railing leads to the second floor. Upstairs, a portion of the second floor is removed so light from the north addition and the southern dormers can penetrate deep into the house. A new floating steel bridge replaces the removed portion of the second floor and links a guest wing to the master wing. 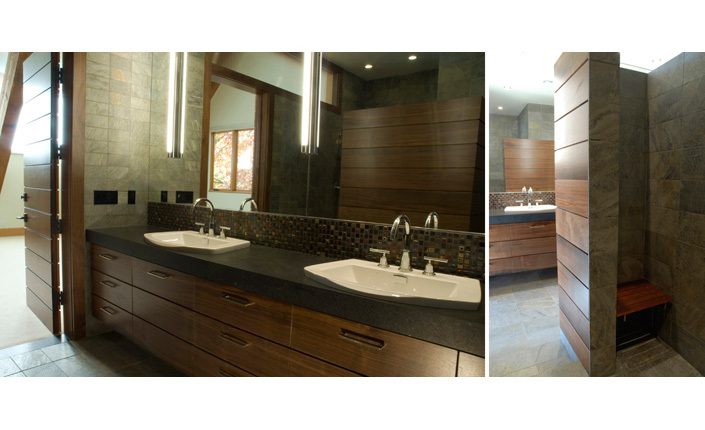 Each wing received a modern update of finishes complete with new bathrooms. 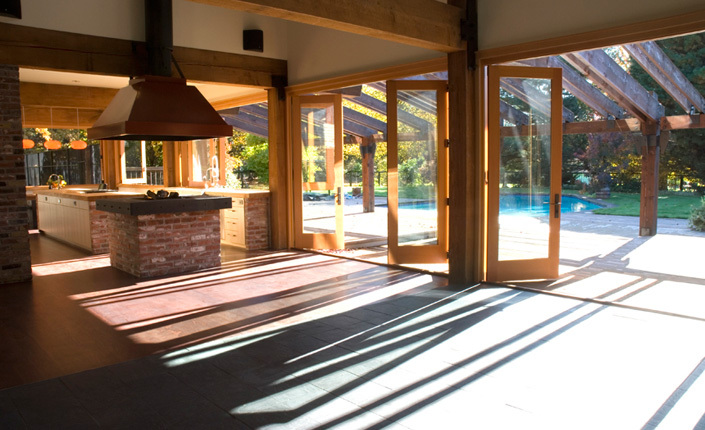 Throughout the interior, there is a sense of modern, light filled calm punctuated by the rustic character and history of the existing timber frame.